In light of these threats, the question naturally arises: what do the North Korean leaders actually want to achieve? 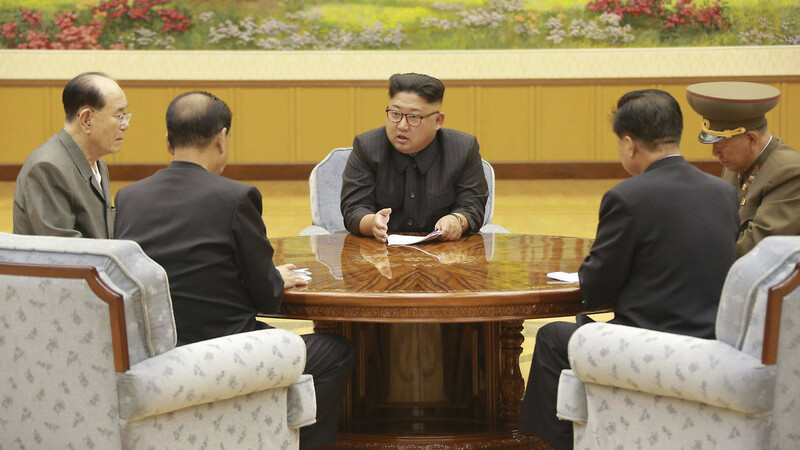 To craft an effective counter-strategy, one needs to fathom their actual motives and aims, for a mistaken assessment might induce Washington and Seoul to pursue unattainable goals—or even to play into Kim Jong-un’s hands. To begin with, North Korean leaders undoubtedly speak in dead earnest when they stress that they “will never give up their treasured nuclear sword” and that they are no longer interested in entering negotiations about any sort of “complete, verifiable, and irreversible” denuclearization. This is actually quite in accordance with the conduct of other aspiring nuclear powers. The historical record shows that nearly every successful process of nuclear reversal—such as that of South Korea, Taiwan, Brazil, Argentina, and Libya—occurred in countries that had not yet reached the technological threshold that the DPRK crossed a decade ago. The less advanced a nation’s nuclear weapons program is, the less painful it is to give it up; the more investments and achievements have been made, the greater the temptation to retain this prestigious and formidable capability. So far, the sole country that ever dismantled its self-developed and deliverable nuclear weapons was South Africa, and it did so in tandem with the dismantlement of apartheid. Denuclearization through regime change is evidently an unattractive option to the North Korean leadership. Indeed, the North Korean leaders have good reason to consider their nuclear weapons an effective guarantee of regime survival and a cornerstone of their military doctrine. Since 1992, the DPRK has not been able to obtain any sizable quantity of up-to-date conventional armaments either from China or from Russia, and thus the option of forsaking its nuclear weapons program in exchange for external military assistance—a strategy pursued by South Korea since 1975—was not feasible. In particular, North Korea’s air force has been hopelessly stuck at the level of the 1980s, a deficiency that increased Pyongyang’s determination to build ballistic missiles. Nonetheless, it would be a simplification to assume that the sole concern of the North Korean leaders is the survival of their regime. Had this been the case, they might have pursued their aim in a less provocative way: by relying on China and building up their conventional military forces without openly threatening their neighbors—an option the Burmese junta took in the 1990s and 2000s; by adopting a position of deliberate nuclear ambiguity in the manner of Israel; or by conducting subcritical tests and/or minimizing the number of their full-scale nuclear tests as Pakistan and India did. Instead, Pyongyang preferred an approach of aggressive brinkmanship. From a US and South Korean perspective, the regime’s fundamental unreliability and its long record of armed violence against the ROK—a problem of intentions—may be regarded as an even more serious challenge than the country’s actual nuclear capabilities. Had North Korea decided to act as a “responsible” and non-provocative nuclear power, the US might have found it easier to swallow the bitter pill and recognize the DPRK as a nuclear state, as South Korean presidential security adviser Moon Chung-in suggested, citing India and Pakistan as a precedent. However, Pyongyang did the very opposite, and thus it has effectively created a deadlock. One major factor behind North Korea’s belligerent posturing is Pyongyang’s perennial competition with Seoul. Since the 1980s, the DPRK has had no hope to outperform the ROK in economics or diplomacy. The northern leaders have not been able to ignore the economic giant next door, but they have been absolutely unwilling to acknowledge that their state was in any sense inferior to their neighbor. By openly demonstrating their nuclear, missile, and satellite capabilities, they can uphold the claim of Pyongyang’s military superiority over Seoul, and deter any attempt at regime change and absorption. Pyongyang’s obsessive competition with Seoul does not necessarily indicate, however, that the regime’s efforts to develop a nuclear strike capability are based on the assumption that the threat of a North Korean nuclear attack would discourage the US from protecting the ROK. In the opinion of Daniel Pinkston, North Korea seeks to browbeat Washington into annulling its alliances with Seoul and Tokyo, withdrawing its troops from the region, and ultimately accepting Korean unification on Pyongyang’s terms. While it is beyond doubt that the DPRK would heartily welcome such a scenario, it is less certain whether Kim Jong-un and his generals are of the opinion that provocative nuclear muscle-flexing is the most effective way to achieve this particular aim. During and after the Cold War, the North Korean leaders observed again and again that a relaxation of regional tension or America’s preoccupation with other strategic theaters was potentially conducive to a reduction of the US military presence in the ROK as witnessed in 1949, 1970-1971, 1977-1978, and 1991. So aware were they of these linkages that in 1971 they suggested to the baffled and indignant Soviet leaders that the annulment of the Soviet-DPRK treaty might persuade Washington and Tokyo to scrap their own treaties with Seoul. In contrast, direct North Korean security threats induced America to step up its assistance to the ROK as in 1950, 1968, 1979, and lately during the deployment of the Terminal High Altitude Area Defense (THAAD), rather than to cut its losses and disengage. In recent times, North Korean propaganda also emphasized that the administration of Abe Shinzo used the “pretext” of the North Korean threat to pass new security bills, and expand US-Japanese military cooperation. If, however, North Korea’s immediate aim was to provoke friction between China and the US-Japan-ROK alliance, then Pyongyang’s recent nuclear and missile tests did produce the desired results. The more aggressively the DPRK behaved, the more efforts the US, Japan, and South Korea made to upgrade their missile defense systems, which in turn increasingly aggravated their relations with China. Notably, the North Korean media started to present THAAD as a threat to China more than half a year before Beijing issued its first protest against the system, and it harped on the issue even when the Chinese press toned down its criticism. Pyongyang also highlighted such issues as the Senkaku/Diaoyu dispute, Japan’s new military legislation, Japanese-ROK intelligence cooperation, and US, Japanese, and South Korean “meddling” in the South China Sea dispute, all of which were red flags to Beijing. From this perspective, the THAAD deployment, triggered as it was by North Korea’s provocative acts, seems to have been at least partly advantageous to the DPRK. While it deepened South Korea’s integration into the US security architecture, at the same time it disrupted the Chinese-ROK partnership that Park Geun-hye had created in 2013-2014. In this respect, Pyongyang’s aims are diametrically opposed to Seoul’s. Caught between Washington and Beijing, the new administration of Moon Jae-in has done its best to pursue a cooperation-oriented, multidirectional diplomacy toward the US, China, and Japan. These efforts were by no means appreciated by the North Korean leaders, who sought to generate friction between South Korea and its partners. For instance, when the speaker of the ROK National Assembly visited Japan, North Korean propaganda described his visit as an “act of treachery.” In fact, even during the ROK’s Sunshine Policy from 1998-2007, Pyongyang consistently blocked Seoul’s attempts to create an inter-Korean transport corridor linking South Korea with China and Russia. Under such conditions, the options available to US and South Korean policy-makers are fairly limited. Negotiated denuclearization is flatly rejected by Pyongyang, forceful denuclearization would carry enormous risks, and the DPRK shows no inclination to act as a “responsible” nuclear power that Washington could possibly recognize as a de facto nuclear state. There is one thing, however, that the regional stakeholders can do. They need to keep in mind that Pyongyang’s provocative actions are often expressly aimed at driving a wedge between them, and they should make conscious efforts not to take the bait. As the saying goes: One should not feed the troll. Dr. Balázs Szalontai is Associate Professor at Korea University, Sejong Campus.